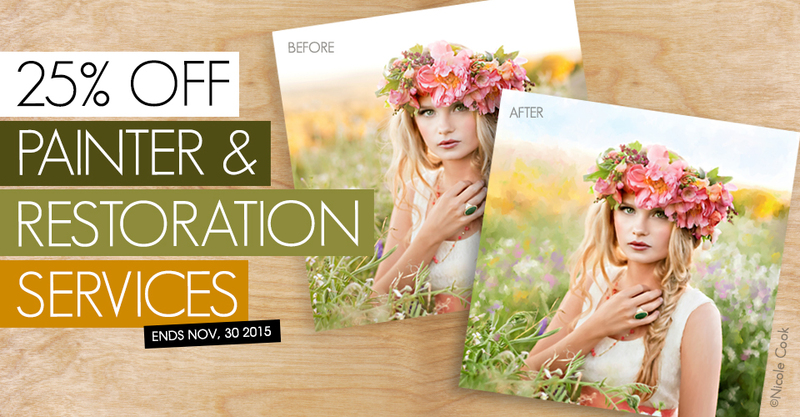 For the entire month of November, you can save 25% on Painter and Restoration Services. Our dedicated art team can bring your vision to life and save you precious time during your busiest season of the year. From digital paintings to tricky restoration projects, you can expect to receive your work in as little as 2-3 days. If you have a complex request, give us a call and we will happily provide an estimate. Do you offer the old style fiber paper for restoration photos? Hi Ann, our Fine Art paper is probably the closest to a fiber paper. If you’d like a paper sample, let us know!